Adah On Her Way Home!!! I'd Like Extra MSMG Please! Thanks Pookster! What a nice surprise coming home to find a mystery package for me. I have hung the street sign on my bedroom wall, contemplating purchasing a baby iguana to train to walk on a leash down the streets of Dover. Glad you like it. I found it online and said to myself, "Sarah needs that." Not even, "Sarah might like that." No, you needed it. 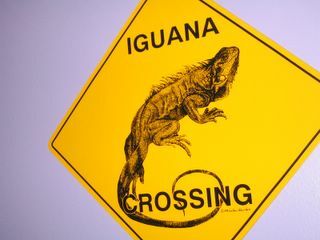 I could not imagine you without an "iguana crossing" sign.